Regularly rotating your tires, usually with an oil change, as included with the Midas Touch™ Maintenance Package, insures your tires will last you as long as possible. If you are not rotating your tires with our Midas Touch™ Maintenance Package we recommend rotating your tires in accordance with your vehicle manufacturer’s maintenance schedule – usually every 6,000 to 10,000 miles. Inspect for damage and/or uneven wear. Evaluate the tread depth and overall condition of the wheels and lug nuts. 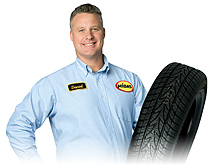 Rotate tires in a method recommended by your vehicle’s manufacturer. Reinstall tires and lug nuts according to your vehicle’s specifications.